Unless because it's done that way on piano, so that's why and no other reason. At first glance, you might think, "that's not so bad". However, once you add music, especially complicated music, this type of notation can be quite unwieldy. So it's split into what we commonly see as the Grand Staff, which, as others have mentioned, usually relegates a hand to each staff. So, we've solved a visual problem by separating the staves with some space. But now we have another problem: what if we want to know how loud / soft to play the music? It is more difficult for the musician to read the music and the dynamics this way. However, keeping dynamics and other indications between staves – for the most part – can help reduce visual clutter and lead to better reading / performance. In order for the staves to be exactly aligned, you'll need to sacrifice other important visual, performative, and logistical elements in the music. Using ledger lines helps us cope with this off-set. 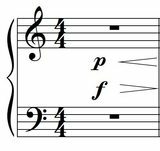 For publishers, composers, and performers, the staff spacing relative to middle C just isn't that important. Because the the bigger point behind the grand staff for piano is to have one for each hand rather than show an absolute note position on the instrument. 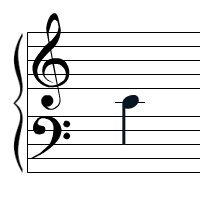 It's not too uncommon to see two treble or two bass clefs in the grand staff. For example the way Imagine by John Lennon is notated for piano using two bass clefs. There are also other modifiers that can make the top or bottom staff different like octave clefs, ottava alta marks, and ottava bassa marks. It's useful to teach the grand staff the way you mentioned, but in practice when playing keeping them their own systems is important. The top staff is for the right hand, and the bottom staff is for the left hand. As Dom says, you could have two treble or two bass clefs, but even with one of each as pictured, there would be severe problems with having the staffs this close. It's common for the left hand notes to go several ledger lines above the staff, or for the right hand notes to go below. We need the space to see this. 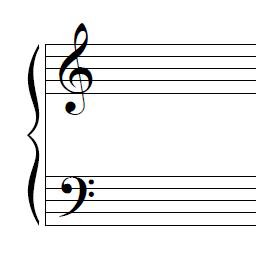 Using multiple staves is meant to separate multiple logical voices, or parts, within the music. Consider that there may be more than two voices for a given piece of music (SATB is an example; soprano, alto, tenor, and bass). People have mentioned that one staff is for the left hand and one is for the right - but this is an oversimplification which leads to questions like the ones you asked. 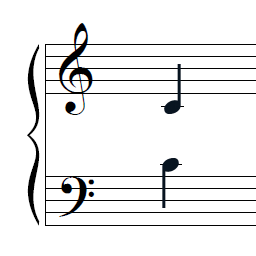 When you think of music in terms of more than two voices, the idea of aligning the staves becomes more difficult to implement. As far as finding staves printed as you would like, they probably don't exist. However, it is quite easy to make up some of your own, as in your third example. Once one sheet is prepared, it's simple to copy others off. That would then be easy to play harp music from. You'd probably end up writing out by hand, but that's pretty well what I do for drum music for students, and isn't particularly onerous. Or come up with something like an alto clef, putting a middle note from the harp at a convenient place on a single staff - like several other instruments have done. Not the answer you're looking for? Browse other questions tagged notation sheet-music instruments clefs or ask your own question. With sheet music, what happens with sharps and double sharps that are already sharped in the key signature? Why are some measures separated by double lines? Are there limits for the possible pieces for different violins? In a music scale why C ? why not D♭♭ or B♯? Are there unicode characters for double sharp and double flat? is it necessary to learn notation or how to read staff paper for making music? Why are ledger lines (lines below or above the staff) used in writing music?